This crazy and disastrous novel is simply so amazing. Told through a series of hacked emails, maps, files, IMs, medical records, interviews, and documents of that nature, we are gifted with a story of a rescue mission gone awry after a giant corporation attempts to destroy an entire community to eliminate the competition. Prepare for a capitalistic version of Star Wars meets Station Eleven in this completely immersing novel that you won’t be able to put down. For fans of Marie Lu comes the first book in an epic series that bends the sci-fi genre into a new dimension. The year is 2575, and two rival megacorporations are at war over a planet that’s little more than a speck at the edge of the universe. Now with enemy fire raining down on them, Kady and Ezra—who are barely even talking to each other—are forced to evacuate with a hostile warship in hot pursuit. But their problems are just getting started. A plague has broken out and is mutating with terrifying results; the fleet’s AI may actually be their enemy; and nobody in charge will say what’s really going on. As Kady hacks into a web of data to find the truth, it’s clear the only person who can help her is the ex-boyfriend she swore she’d never speak to again. 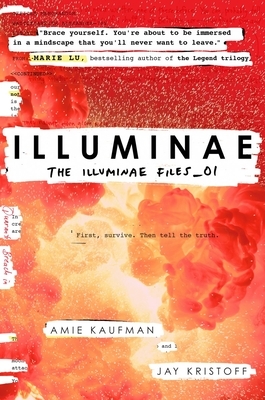 Told through a fascinating dossier of hacked documents—including emails, maps, files, IMs, medical reports, interviews, and more—Illuminae is the first book in a heart-stopping trilogy about lives interrupted, the price of truth, and the courage of everyday heroes. Amie Kaufman is the New York Times bestselling co-author of the Starbound series. Jay Kristoff is the award-winning author of the Lotus War series. Collectively, they are 12’5” tall and live in Melbourne, Australia, with two long-suffering spouses, two rescue dogs, and a plentiful supply of caffeine. They met, thanks to international taxation law, and stuck together due to a shared love of blowing things up and breaking hearts. You can learn more about Amie and Jay at amiekaufman.com and jaykristoff.com.